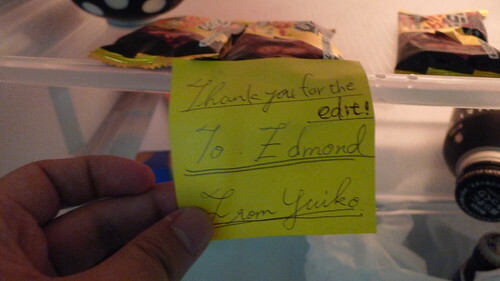 So I've wrapped up the shoot for my newest Japanese short film, 3PM last Friday. And had am now editing it. Here's a photo of the cast and crew sent to me by main actress Yumiko Kitazawa (you can also read about the shoot from her blog, but it's only in Japanese). Like I said, I've immediately started work on editing the film the night when I finished the shoot, and things seem encouraging thus far. 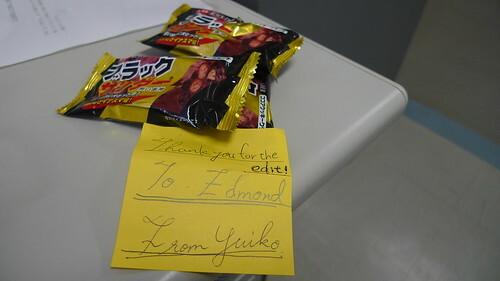 It was cool to receive a thank you note from Yumiko over the weekend, and then Yuiko, who told me that she had left some Black Thunder (my favourite chocolate bar that I often have for lunch) in the fridge at the editing lab. So this morning went I went to the lab to continue my editing, I found the Black Thunders. Thanks. 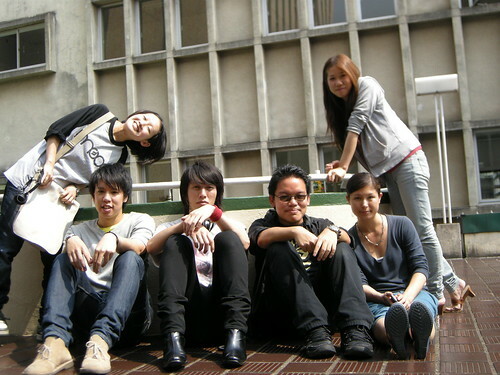 It was a very fun shoot. Black Thunder is not just a chocolate bar. It is a way of life. As a bonus, I'm sharing the video of the June 12th line-reading session we had with you guys (I mentioned the session here).